Headache chiropractic can justly claim to have the best treatment. Headache chiropractic probably treated better by no other profession and without the serious side effects of chronic medication. A life can be totally ruined by cephalgia, as it's known in medical jargon. Attention to the upper neck and jaw joints has changed that for millions of people. Few things have struck me more forcibly in practice than how chronic headaches have made many people's lives totally miserable. Probably a week never passes when I don't have a new patient who has been suffering for thirty or more years from headaches. Chiropractic can and does change that. A cure? Probably unlikely. If you are taking analgesics on a regular basis, and your doctor has nothing more to offer, and the other treatments that you have tried have been at best palliative, then it's time to try chiropractic. And if you've been to one chiropractor, and it's not helping, then go to another. Headaches are a tough call. In chiropractic tips you will learn more about much more about our profession. Signed up yet? Five short emails for free. Chiropractic Tips. More specifically, what is chiropractic headache ? A headache is a condition of pain in the head, and frequently the neck or upper back pain may also be interpreted as a chiropractic headache. It ranks amongst the most common complaints, partly because there are many causes. Neck injury (after whiplash), poor posture (teachers marking books), long periods behind the wheel or computer, stress, allergies, eye-strain, the jaw joint and many more, many of which respond excellently to chiropractic headache treatment. √ Treat the cause. Work to prevent re-occurence, think posture. treating symptoms alone is always unwise, but never more so than taking analgesics on a regular basis. That is positively dangerous for your kidneys, the main reason why one-in-nine Americans suffer from chronic kidney disease. DON'T BECOME ONE! Chiropractic Help? A recent study found that the INDIRECT annual cost for headache in the USA ($19.6 billion) was only slightly less that for back pain ($19.8 billion). 'Indirect' costs are those associated with lost productivity due to sick leave, ‘absenteeism’ and decreased efficiency now called ‘presenteeism’. It is staggeringly large in monetary terms, and is where chiropractic really comes into its own: numerous Workman’s Compensation studies conclude that chiropractors get their patients back on the job sooner. With chiropractic headache does not need to blight your life. Headaches due to life-threatening conditions such as meningitis, encephalitis, cerebral aneurysms, extremely high blood pressure and brain tumors are rare. But in the evaluation of what causes headaches, they should always obviously be considered. Sudden onset, often with vomiting is a red flag. That is not headache chiropractic! Extreme pain on flexing your neck, headache and an associated fever are more cardinal signs. Do not pass go, do not collect two hundred dollars, go straight to your medical doctor. Now! If you love to read medical thrillers, like the famous robin cook, then you may enjoy an enthralling bernard preston short story about a headache with a difference. A schoolgirl on a sundial making expedition wants to know why time hasn't been metricated. Wouldn't 10 new hours be easy to work with than twenty four? A hundred new minutes in an hour? But she suffers from terrible headaches. Click on father time. A certain percentage of headaches among women are caused by ever-fluctuating estrogen, and may occur prior to, during or even mid-cycle menstruation. Nor is this a chiropractic headache. However many women find that chiropractic helps their menstrual cramps. Father Time headache with a difference. Whiplash headache - with a difference. This is a cul de sac you'll love: Chiropractic help Friday fun headache. Google appears to frown on too many links, so phrases in bold, like that Father Time above, and Jan Jansen further down, need to be put into the Site Search function in the navigation bar on your left if you want more information. Meningitis is certainly not a job for the chiropractor; even if you have a long success story with headache chiropractic, if you have a fever, make a start with your medical doctor. The brain in itself is not sensitive to pain, because it lacks pain-sensitive nerve fibers. Headaches are mostly caused by irritation, in one way or another, of the network of nerves which extend over the scalp and certain nerves in the face, mouth, and throat and jaw joints. The meninges and the blood vessels do have pain perception nerve fibres which can result in headache chiropractic. It has now been proved that subluxation in the upper neck can cause traction to and irritation of the meninges resulting in headache chiropractic. For more about the upper cervical anatomy, Click here. ATLANTO AXIAL JOINT ANATOMY is complex. At the heart of Bernard Preston's new novel is the death of Santie's mother from meningitis. Severe headache, a high temperature and a very stiff neck and the key signs. A Family Affair reviews is for those who enjoy controversy and bit of spice. This is often described as 'the worst headache of my life' and the hallmark is very sudden onset - within 1-2 minutes. Migraine headache is the most common type of vascular headache. Migraine headaches are usually characterized by severe pain on one or both sides of the head, an upset stomach, and, for some people, disturbed vision. It is more common in women. Neck pain and headache is a common feature. While vascular changes are evident during a migraine, the cause of the headache is neurologic, not vascular, hence even true migraines mostly responds well to headache chiropractic. Other kinds of vascular headaches include cluster headaches, which cause repeated episodes of intense pain, and headaches resulting from very high blood pressure. A headache may also be a symptom of sinusitis. The sinuses are supplied by the trigeminal nerve, the largest cranial nerve. I'ts sensory nucleus is in the neck, so the pain of sinusitis is often also felt in the neck. Like other types of pain, headaches can serve as warning signals of even more serious disorders than subluxations. This is particularly true for headaches caused by inflammation and infection, including those related to meningitis, a stiff neck with high fever is a red flag. Sorry to keep repeating this, but albeit rare, meningitis is extremely serious and can and does cause sudden death; everyone should we aware of the symptoms. You get no second chance. So, headaches often result from other conditions of the head and neck. Some of these are indeed are chiropractic headaches which is why your chiropractor will give you a good examination in order to make the correct diagnosis. Not least, constipation is a known cause of headaches. If you are suffering from headaches, and constipation, then beets are a very sensible and simple place to begin. Migraine and the jaw joint are often closely associated. Migraine sufferers have been found to clench their jaw muscle, the temporalis, thirteen times more than normal. 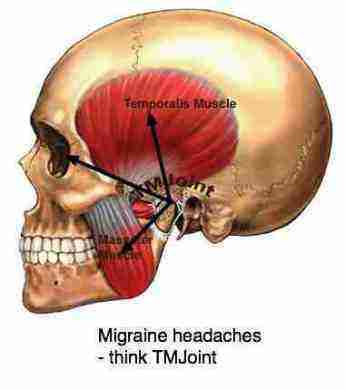 For more about migraine and the temporo mandibular joint read tmj anatomy below. Did you notice where the woman in the picture at the top of this page is rubbing her head? The temporalis muscle is a biggie in headache chiropractic, often associated with a problem in the jaw joint. 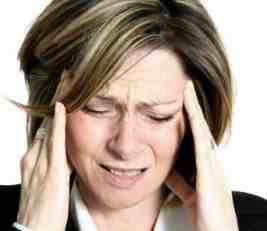 Muscular headaches may be chiropractic headache. TMJ syndrome can cause very severe headaches and neck pain; the sensory nucleus of the trigeminal nerve that supplies the jaw joint lies in the upper cervical spine. The muscles of the head may similarly be sensitive to pain, sometimes from jaw joint conditions causing headaches. Muscular headaches appear to involve the tightening or tensing of facial and neck muscles, caused by poor posture and stress; they may radiate to the forehead. Imbalance in the pelvis may result in tension all the way up the spine to the neck, causing muscular headaches Chiropractic successfully addresses headaches because we look at the cause. After poor posture, subluxations in the neck are probably the most common cause of muscular tension. Cervicogenic headaches originate from disorders of the neck, especially the facet joints. We find in chiropractic headache is often precipitated by an abnormal neck movement (eg craning your neck, or washing your hair in the basin) and/or sustained awkward head positioning (eg. watching TV with your head turned). It is often accompanied by restricted cervical range of motion, same-sided neck, shoulder, or arm pain. The cause mostly is an old injury: whiplash CHIROPRACTIC, a fall down the stairs, horse-riding accidents etc. Most people will experience headaches occasionally. The vast majority are benign and self-limiting and need no care other than a good sleep and perhaps an occasional over-the-counter painkillers such as paracetamol. However, recurrent headache is common and mostly an unnecessarily blight on many peoples’ lives. Think Headache Chiropractic before Headache Pills! Chiropractic can and does address muscular and cervicogenic headache with confidence because we make every attempt to treat the cause rather the symptoms. Not all headaches require medical attention, and respond with simple painkillers such as paracetamol/acetaminophen or aspirin. Nevertheless recognise these treat the symptoms, not the cause. If you are taking more than 5 analgesics per month (other than around premenstral time) then it is time to consult your chiropractor. Chiropractic care will consist of an excellent history, a thorough examination and the treatment consists of gentle adjustments of the spine, perhaps some soft tissue work, trigger point therapy, consideration of the jaw joint, followed by exercises, stretches and rehabilitation. TREAT THE CAUSE. WORK TO PREVENT RECURRENCE. From the coalface, frankly should be taken with a pinch of salt; it's not scientific. The cause? A year ago a young woman, 28, consulted me for headaches. She had been to her medical doctor, and another chiropractor. A careful examination and her history (a melanoma) very soon pointed to another cause. Very, very sadly a metastasis to the brain. She died last week. The exception that proves the rule. Most headaches come from a problem in the neck or jaw, but sometimes it's something ugly. Do you wear a hat in the sun? Your children? In recurrent unexplained headache chiropractic type or other, healthcare professionals may recommend keeping a diary with entries on type of pain, associated symptoms, precipitating and aggravating factors. This may reveal specific patterns, such as an association with medication, menstruation or absenteeism or with certain foods. Some forms of headache may be amenable to simply avoiding certain foods. One popular herbal preventive treatment for migraines is Feverfew. Magnesium, Vitamin B2, and B6 and Coenzyme Q10 are "natural" supplements that have shown some efficacy for migraine prevention. Headache treatment trials are notoriously difficult to design as headache is probably one of the most profoundly placebo-sensitive conditions in medicine. However, there is much well documented research proving beyond doubt that chiropractic care has made a major contribution to the care of headache sufferers. Some neurologists are opposed to spinal manipulation as they say it may precipitate an arterial tear and may cause a stroke. However, this is so rare, less than one case in a million manipulations, and is thus far, far safer than medication. Even anti-inflammatory medication, often prescribed for headache chiropractic, has been proved IN ONE YEAR to have caused 14 000 deaths in the USA alone. The most cited study of chiropractic efficacy is Nelson's randomized, but not double-blinded trial, comparing chiropractic to medical care, which included the drug amitriptyline, for the treatment of Migraine Headache. During the 4-week trial, both groups reduced in symptoms. After withdrawal of treatment, the medical group relapsed or got worse, whereas the group that received chiropractic headache care maintained their improvements after treatment was stopped. Rebound headaches is a frightening reality for those taking medication every day. Long-term use of painkillers is discouraged as this has been proved to lead to "rebound headache" on withdrawal from the analgesics, and actual aggravation of the headaches, not to mention life-threatening kidney disease. These rebounds are certainly not headache chiropractic. It's purely a well documented side effect of the medication. By taking too much medication, are you actually the cause of your chronic headaches? No TV sports program has ever touched me as deeply as the KIDNEY OLYMPICS. The sheer guts and courage of the athletes is overwhelming. Even more though, was the warning by a doctor at the end of the program: "Most of the athletes participating here lost their kidneys through taking over the counter painkillers." A quote from the Kidney Foundation website: "Generally, when used according to directions, over-the-counter analgesics are safe. However, heavy or long-term use of these medicines, especially those that contain a mixture of painkilling ingredients --such as aspirin, acetaminophen and caffeine--in one pill, have been linked to chronic kidney disease." Think Headache Chiropractic for your pain as an alternative, a better alternative, than swallowing pills. The Kidney foundation and painmeds analgesics will inspire you to reduce your headache pills. One in nine Americans have Chronic Kidney Disease. Five Surprising Ways You Could Be Damaging Your Kidneys. This Neck pain anatomy casefile will give you some idea of the complexity of these issues. Should you be taking Ritalin for any reason, note that headache is one of the side effects; read more about it at attention deficit Bernie.